Last week we began a mini-series of short articles called, “Why We Observe the Lord’s Supper Weekly?” Our hope was to establish that although the Bible does not explicitly command (or forbid) a particular frequency for celebrating communion, the Bible does provide strong evidence for a weekly observance in the New Testament church. We considered such passages as Acts 20:7; 1 Cor 11:20; and 1 Cor 11:25. 1. Celebrating the Lord’s Supper weekly helps us to keep the Gospel central in our gatherings. Why do we gather as the people of God? Why do we meet weekly? Is it for singing? Is it for fellowship? Is it to hear the Word? The answer to this is simply, Yes. All of these things are significant acts and elements of the gathered church. But, all of these elements are aimed to facilitate what is our ultimate purpose as a church: to GLORIFY GOD by reaching Up to Him in worship. We gather to EXALT God by treasuring Christ. We gather to WORSHIP. Therefore, “church” has not happened if Jesus Christ has not been celebrated and proclaimed as Lord and Savior among us. So, how do we do this? In song, certainly. In preaching, absolutely. In prayers and Scripture readings, undoubtedly. Yet, the Lord’s Supper has uniquely been given to us to “do this in remembrance” of Him (1 Cor 11:24) and to “proclaim the Lord’s death until he comes” (11:26). Through celebrating the Lord’s Supper weekly, we bake into the very fabric of every week’s gathering a time to not only remember but to celebrate, to feast on, to proclaim, and to anticipate the Risen & Reigning King. How often do you need your attention shifted from the things of this world to the glories of Christ? I need all the help I can get, each and every single week. Observing the Supper helps us to ensure that no matter what passage, what series, what season — the Gospel of Jesus Christ is central to our gatherings. 2. Celebrating the Lord’s Supper weekly is evangelistic. Celebrating the Lord’s Supper, glorying in Christ, explaining what the elements represent, and even clarifying who it is for (i.e. “fencing the table”) bakes evangelism into our weekly services. It is the responsibility of our elders to ensure that, as far as we are able, to make sure that our gatherings are intelligible to outsiders (1 Cor 14:24-25). And thus, it is our responsibility to ensure that the Lord’s Supper is explained and outlined in a faithful manner. When we do this, we are repeatedly reminded that there are real categories such as “Christian” and “non-Christian.” This Supper is for repentant sinners (i.e. Christians). It is not for those outside the faith and/or are in unrepentant sin. Now, some may say “that’s exclusivistic” and “you’re making non-Christians feel uncomfortable.” And, our response would be, you are probably right … in a way. To clarify, “we” are not making anyone feel anyway – God’s Word and Spirit are. Although we certainly seek to be respectful and sensitive we also firmly believe that it is the most respectful and sensitive to actually speak the truth. In other words, it is NOT kind — NOT gracious — NOT loving to blur lines and biblical categories. To make an unbeliever feel “at home” and completely enfolded would actually be dangerous for their souls! So, in the Supper we say, “This is for the believer” and “non-Christian, this is not for you … at this time … but we pray and long to take this with you soon.” This honest, gracious demarcation provokes the non-believer to introspection and spiritual exploration. In that way, the Supper is Gospel preaching evangelism. 3. Celebrating the Lord’s Supper weekly promotes a culture of holiness and humility. 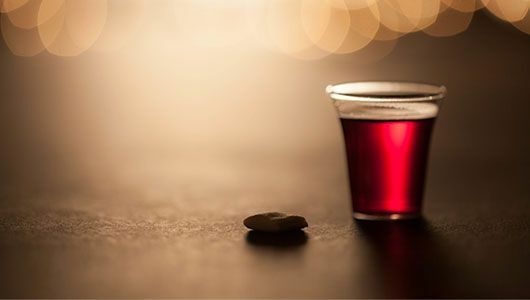 A third and final (for this week) practical benefit from celebrating the Lord’s Supper each week is that each week self-confessing believers are challenged to examine our hearts and motives. Sin is real and deceptive. Sin hardens hearts and deadens the spiritual senses. Sin rips apart relationships and turns us inward upon ourselves. And, if we are honest – many of are so busy rushing from thing to thing in life – that we fail to give our own holiness the attention we should. We often go days or even weeks without ever carefully examining our hearts and confessing sin to the Lord. The Lord’s Supper affords believers an opportunity, every week, to fight against this tendency. It promotes and even demands self-reflection and repentance. We will study this more next week but the apostle Paul writes this, “27 Whoever, therefore, eats the bread or drinks the cup of the Lord in an unworthy manner will be guilty concerning the body and blood of the Lord.28 Let a person examine himself, then, and so eat of the bread and drink of the cup. 29 For anyone who eats and drinks without discerning the body eats and drinks judgment on himself. 30 That is why many of you are weak and ill, and some have died. 31 But if we judged ourselves truly, we would not be judged.” (1 Cor 11). Christians need reminders. We need providential road-blocks that push us toward confession. We need to weekly utilize the means that God has ordained to foster hearts of holiness and humility. We receive the Lord’s Supper weekly toward this end. Next week we will continue on in our consideration of the practical benefits of weekly communion. But, between now and then – take the Lord’s Supper this weekend with grateful, Christ-exalting hearts. Prepare your heart, even before you come, so that you can take the Supper with a clean conscience and a humbled heart. Take and remember. Proclaim the Gospel until our King returns.